Septura are delighted to announce the group’s debut concert series, Kleptomania. 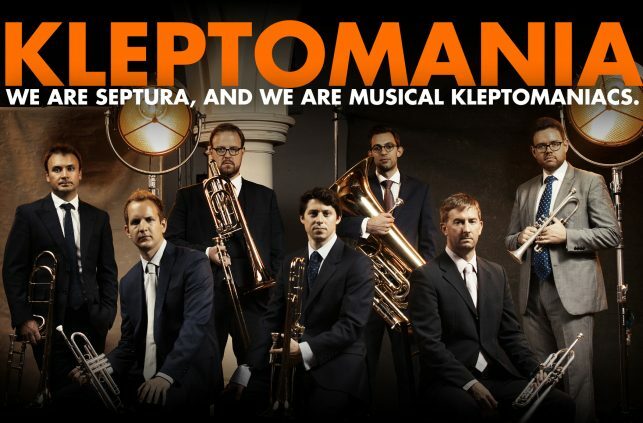 The four concerts will present the prize pickings of music that the group has “stolen” through transcription for brass septet: plunder from string ensembles, pianists, chamber orchestras and singers. The series will take place at both St John’s Smith Square, London and West Road Concert Hall, Cambridge. The brass septet is a brand new invention, and therein lies the root of our compulsion to steal: we have no canon of repertoire, no grand history of great compositions. And so we’re inventing one. Like musical Robin Hoods we thieve from the richest ensembles to create a counterfactual history — a parallel universe in which, in the world of chamber music, the brass septet rules.